Baseball. It’s a funny old game. Someone swings for a ball. Or doesn’t. People run. Bases get loaded. Points get put on the board. I’ve grown to like baseball as something I can casually tune into but I’ll never be one of the many Americans in love with the game. IN terms of movie sports, however, it has really led to a number of wonderful films (Field Of Dreams and Bull Durham being the first that spring to my mind). Moneyball takes baseball and adds a lot of maths to the subject. I know, I know, not really a recipe for an exciting and uplifting movie. Or, at least, that’s what you would assume. 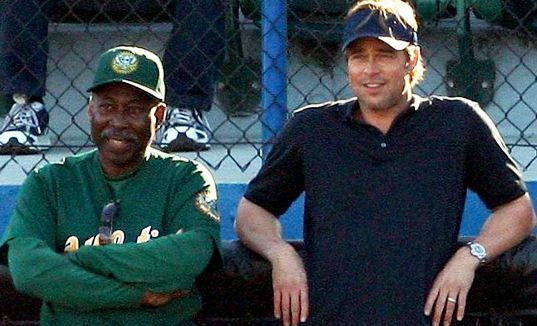 Brad Pitt plays Billy Beane, an ex-player turned general manager who has sadly resigned himself to the fact that the game has seen a wider chasm develop between the poorer teams and the rich. It’s all about the money nowadays and the best players command prices way above what the Oakland A’s can afford to offer. That’s why Beane is intrigued when he meets Peter Brand (Jonah Hill) and discovers a new way to evaluate players and create a team. But nobody else can see what Beane and Brand are aiming for. Not the players, not Art Howe (Philip Seymour Hoffman) as he makes the decisions on the field, not the fans and not the other members of staff. Maybe they will all start to have a bit more faith when the results start improving. IF they improve. Thanks to a decent script by Steven Zaillian and Aaron Sorkin and great direction by Bennett Miller, Moneyball (rather fittingly) overcomes the odds to become another great, emotive movie based around the diamond. The start isn’t all that promising but it does just enough to keep you interested until things really start drawing you in. And you’re completely drawn in. Before you know it, you may find yourself wanting to fist-pump the air and cheer for the underdogs trying a radical new way to improve their scores. Brad Pitt, who seems to be morphing more into Robert Redford with each movie (and I do mean that as a simple, complimentary observation) does well as Billy Beane, his portrayal of someone trying to do his best by people after some bad experiences of his own could almost play out as a metaphor for all attractive Hollywood stars. The quick rise and fall of personal value is, of course, something common to most of the major sports but it’s no less common to those involved with major movie studios. Jonah Hill does very well as the young man finding himself in a unique and powerful position, a casting decision that again feels very much a riff on what happened in the making of this very movie. Is Philip Seymour Hoffman ever less than brilliant? I’d have to say no and he puts in another great performance here. Robin Wright, Ken Medlock, Chris Pratt, Stephen Bishop, Brent Jennings and all of the other cast members provide solid support, there’s not a mis-step from anyone. Appropriately for a film about overcoming the odds to hit a home run, Moneyball manages to overcome the odds and hit a home run.